A WAGON WITH A PORTRAIT OF VLADIMIR LENIN on the front and a huge, white statue of the Soviet Union’s leader Joseph Stalin on the top is rolling through the Red Square. Behind the wagon are some of the Soviet Union’s greatest athletes, marching in front of a cheering crowd and the “greatest friend of Soviet physical culture, the dear leader and beloved teacher” Joseph Stalin himself. The occasion is the Physical Culture Day in the Soviet Union and the year is 1936. Briefly after this parade, Stalin would watch his first professional football match, and the people surrounding him were terrified. Terrified for loose balls flying into the Kremlin, or even worse into the face of the country’s leader. The Physical Culture Day was an annual tradition in the Soviet Union, introduced in 1931, and it was staged and celebrated in all of the USSR’s major cities, where both male and female athletes from the various sports organizations paraded their skills and their support to the leadership. At Red Square, ten thousand lucky people had been squeezed into the stands to watch the parade together with the Soviet officials. The athletes all represented the biggest sporting societies in the USSR, among these the famous Spartak and Dinamo clubs, who not only had the football teams we know from Moscow today, but also a broad variety of different sports spread out in societies all over the Soviet Union. The organizations did, however, have one major difference: their ownership. Dinamo was financed and controlled by the secret police, the NKVD (later the KGB), while Spartak was sponsored by a trade union and therefore independent from the state. This later earned Spartak Moscow’s football team the nickname People’s Team and they quickly became the most popular club in the country. Just like the clash between Spartak and Dinamo, the Physical Culture Day itself was not free from politics. In the brilliant book Spartak Moscow – A History of the People’s Team in the Workers’ State by Robert Edelman he describes how the parades across the country were supposed to symbolize the orderliness and controlled character by the Soviet sports for both the domestic and international audience. This is also why it is impossible to characterize the parades as actual sports event since it was all scripted and supervised to fit the needs of Stalin’s regime. Furthermore, the person they called “the greatest friend of Soviet physical culture”, Joseph Stalin, never attended an actual sports event – but he always showed up at the parades. “Physical Culture in the Soviet Union, by definition, was much broader than simply sport and exercise. It in fact covered a wide spectrum ranging from hygiene and health issues to sports, defence interests, labour concerns, leisure, education, and general cultural enlightenment.” This also explains why the Soviet authorities called for 24 hours of physical culture a day. At these annual celebrations of the Soviet athletes, the differences between Spartak and Dinamo’s athletes became very obvious. Since Dinamo’s athletes represented the police and by extension the authorities they all marched with order and pride, while Spartak’s representatives tried to bring some spontaneity into the event. The football match at the Red Square in 1936 was the perfect example of this. 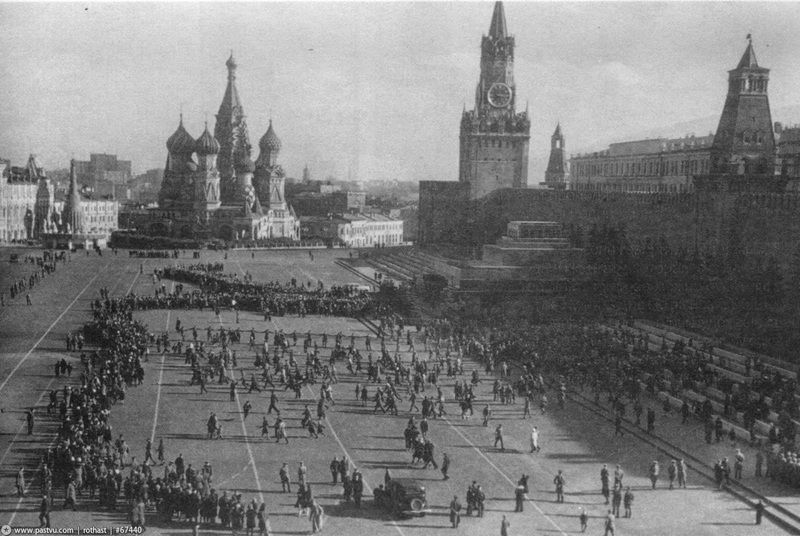 Edelman calls the football match at the Red Square for “the most spectacular challenge to this display of order and discipline” and the man behind the idea was Aleksandr Kosarev, Spartak’s patron in the Communist Party and the leader of the All-Union Young Communist League, also known as the Komsomol or the youth division of the Soviet Communist Party. Despite Spartak’s status as ‘independent’ their lifespan would have been short if they did not have supporters in high places, which Nikolai Starostin, the club’s legendary president, was acutely aware of. He made sure to always invite important members of the Party to the club’s matches. Starostin and Kosarev’s relationship began in 1934 when, after a hunting trip, they agreed to form the first voluntary, nationwide sport society since Dinamo eleven years earlier. Kosarev promised Starostin that he would provide the latter and the new society with political support; another of Starostin’s allies agreed to sponsor the team with enough money to recruit the best available athletes in multiple sports, as well as a brand new permanent training base for the new football club. As preparation for the famous match on the Red Square around 300 Spartak athletes worked on a giant green felt carpet that would cover the square’s cobblestones and work as an interim grass field. The carpet was the size of an actual football field and it was sewn with shoemaking needles and stored across the Kremlin. The day before the parade, the giant carpet was rolled out across the Square as a rehearsal; now all Spartak needed was to prove that the ‘pitch’ was safe to play on. The person Starostin and the Spartak athletes had to convince was a General from the secret police who was highly sceptical – understandably he did not want any serious injuries in front of Stalin on the big day. In Starostin’s biography he tells the story about how he called over a member of Spartak Moscow’s reserve squad and ordered him to jump and fall on the ‘pitch’, which he quickly did. The player, Aleksei Sidorov, did so and quickly stood up again, and when he was asked if it hurt he stated he was fine and offered to do another fall. With some help from the influential Kosarev the General was convinced and the match was approved. When Starostin saw Sidorov the following day before the match his thigh was full of bruises. To this day it is still unknown whether or not Dinamo offered to participate in the match, but the fact is that Spartak’s first team ended up playing its second team. Starostin and Kosarev did not want to disappoint Stalin and the rest of the party top, so in their attempt to bring some spontaneity into the event they planned seven goals before the match. During the match Kosarev stood next to the leader himself, where he, like the Real Madrid fans today, held a white handkerchief in his hand, which he would wave if Stalin looked bored. Before the match Starostin forbade his players to tackle, and if they got hurt they could not show it to the crowd. Fortunately for Starostin, Kosarev and Spartak the match went well, and even though it was only planned to last 30 minutes it ended up going on for around 43. From this point on it would be repeated every year. The huge success did, however, give the players some unexpected problems since only 30 minutes had been planned, so Nikolai Starostin’s younger brother Andrei improvised the last 13 minutes of the match which the first team won 4-3. Three years later, Dinamo finally agreed to participate in the annual exhibition match, and after the first fixture the matches were not scripted in advance. Legend goes that Spartak managed to introduce some spontaneity and surprise into the strictly planned Physical Culture Day’s. Unfortunately for Spartak their luck would soon turn and, in 1938, the patron Aleksandr Kosarev was executed. The reason for his execution was his close friendship with the head of the NKVD, Nikolai Yezhov, who led Joseph Stalin’s Great Purge into its worst period, the so-called Yezhovshchina, where hundreds of thousands were executed. Yezhov himself had to pay for this after he had killed most of the officers in the Soviet army on the brink of the Second World War, and so did his allies. The man who replaced Yezhov was Georgian Lavrenty Beria who would later evolve into Spartak’s worst enemy. The Georgian-born Beria had played for Dinamo Tblisi in his young days and even faced Nikolai Starostin once. When Beria was appointed the new head of the NKVD he also took over Dinamo Moscow; he didn’t take Spartak Moscow’s success and Starostin’s popularity well. With Kosarev gone Spartak and the Starostin brothers suddenly lost their influence in the Communist Party and consequently their protection, so when Beria decided to start a war against the Starostin’s they had little to hit back with. In 1937, the brothers had already – before Beria took over NKVD – been accused of “importing bourgeois methods into Soviet sport” but with the help of Kosarev had they avoided jail. After Kosarev’s execution the circumstances changed, and with Beria’s strong hate against the club, they were not as lucky in 1942 when a new trial began. Beria had forced several Spartak athletes to confess that the Starostin brothers had planned to assassinate Stalin during the match at the Red Square so they could turn the Soviet Union into a fascist state. Nikolai Starostin and his three brothers were all exiled at working camps far from their beloved football club in Moscow, where they stayed until Stalin’s death in 1953 when they were finally rehabilitated.